Review written by and copyright: Noor Razzak/Jarrod Baker (16th March 2007). Based on the 1995 novel by Christopher Priest, "The Prestige" follows the professional and personal rivalry between two stage magicians in turn-of-the-century London. The bitter animosity between the two performers, Robert Angier (Hugh Jackman) and Alfred Borden (Christian Bale) begins when both are working as ringers : basically audience plants who "volunteer" to assist with tricks : for another, older magician. The magician's assistant (Piper Perabo) is Angier's wife, and when she is killed in a tragic accident, Angier blames Borden for her death. Angier, consumed by his rage at Borden, begins a relentless campaign to ruin him : with Borden responding in kind at every opportunity. Eventually Angier begins to focus on discovering how Borden, the more talented of the two, performs his most successful trick, 'The Transported Man'. This obsession leads him to travel halfway around the world in search of answers, alienating those close to him in the process. Christopher Priest apparently was insistent that Christopher Nolan should be the director to bring "The Prestige" to the screen, despite interest from Sam Mendes : Priest is apparently a fan of both "Memento" (2000) and Nolan's lesser known debut feature, "Following" (1998). 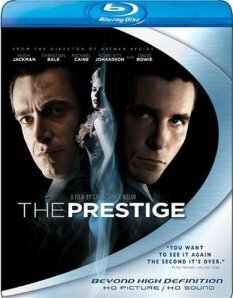 It's not hard to conclude that Priest's insistence paid off : "The Prestige" is an exceptional film, gripping and thrilling from beginning to end. It uses a fractured timeline to great narrative effect, without ever seeming confusing; similarly despite the film's twists and surprises you never feel as if information is being deliberately withheld from you : the reveals don't seem cheap or forced. Especially fascinating are the often macabre insights offered into the techniques behind Angier and Borden's tricks : from simple sleight of hand, to complex mechanical apparatuses, to extended and dedicated deceptions. But this is only part of what makes "The Prestige" so compelling, and so rewarding : it's also sumptuously filmed, and thoroughly believable, even when it strays from the bounds of stage magic and delves into the genuinely supernatural. In fact, by the time the credits are rolling, you'll pretty much be ready to see it again right away. Helped in no small part by note-perfect performances from both of the two leads, not to mention the superb supporting cast : which includes Michael Caine, David Bowie, Scarlett Johansson and Andy Serkis : "The Prestige" must rank as one of the best films of 2006. Highly recommended. This film is presented in its original theatrical ratio of 2.35:1, this transfer is in 1080p 24 fps and was encoded using AVC MPEG-4 compression. In keeping with a lot of recent Blu-ray releases this transfer is top notch, the original source image is pristine and as a result this transfer is pristine. Sharpness is consistent throughout the print with fine detail visible in any lighting condition. Colors are rich and vivid without any trace of bleeding; furthermore skin tones appear natural and balanced. Blacks are deep and bold with shadow detail remaining impeccably consistent throughout the transfer. I was impressed with the overall crispness of the image as it presents this film beautifully as the disc's dual layers of space allow it to breath. Buena Vista has offered up four audio tracks for this film, an uncompressed English PCM 5.1 track encoded at 48kHz / 16-bit as well as track in English Dolby Digital 5.1, French Dolby Digital 5.1 and Spanish Dolby Digital 5.1. For the purpose of this review I viewed the film with its PCM track. As much as I loved the visuals of this film I also loved this PCM track, bravo Buena Vista for another winner in the sound track department, it's hard to set a president when new benchmarks are reached and this track is another shinning example of that quality. Dialogue is clean and distortion free, but it's the track dynamic range that will impress your ears and put your surround system through an exhausting workout. The Victorian world of these characters comes to life with each channel outputting a well mixed soundtrack that travels between subtle ambient environmental surrounds to a bass filled aggressiveness that is complimented with the haunting score that virtually envelopes you. This PCM track makes the prefect compliment to the lush and splendid transfer. Optional subtitles are also available in English for the hearing impaired, French and Spanish. This Blu-ray disc features all the extras seen on the standard DVD release, this includes the 6-part director's notebook featurettes as well as 4 galleries and a handful of bonus trailers. Below is a closer look at these supplements. - "The Director's Notebook" in this clip Nolan talks about the film's period and how exciting that tine was in terms of the discoveries made, as well as the relationships between scientists and magicians in selling old tricks with new technology. He also talks about the spiritual aspects of that era and the fascination with the 'other world' as the cast also talk about the profession of magicians among other things. - "Conjuring the Past" takes a look at the film's production design and how they managed to turn locations and studio lots into Victorian era London, the clip also focuses on the casting of the characters all of which were previously not associated with period films (something Nolan looked for on purpose as he wanted the film to feel more contemporary) as well as the wardrobe of the time. - "The Visual Maze" takes a closer look at the look and feel of the film from the perspective of the lighting and photography, we learn about the camera techniques utilized on this film, plus how the narrative structure compliments the shooting style. - "Metaphors of Deception" takes a look at how the film unravels its story much like how a trick is revealed, it primarily focuses on the adaptation process of the script and how Nolan managed to transform the literary metaphors in the novel into visual metaphors on screen. - "Tesla: The Man Who Invented the Twentieth Century" takes a look at this very interesting character and what he actually managed to achieve back in that time, Nolan comments on getting Bowie to play the role and convincing him among other things. - "Resonances" Nolan shares his hopes for what audiences get from the film. - "Film" which features 26 images of the cast taken during the principle photography. - "Behind-the-Scenes" includes 22 images of the cast and crew at work. - "Costumes and Sets" includes 26 images of the cast in the attire and also some pictures of the elaborate sets created for the film. - "Poster Art" includes 10 images of the various posters advertising the magic shows that were created for the film. -	"Blu-ray" promo spot which runs for 1 minute 16 seconds. -	"Invincible" which runs for 2 minutes 33 seconds. -	"The Guardian" which runs for 2 minutes 30 seconds. Also included is "Movie Showcase" which jumps to three key reference scenes that show off the high-definition quality. I was disappointed that Nolan didn't record an audio commentary for this film, but in the mean time this release is a decent enough with the great picture and sound quality plus the extras ported over from the DVD release. This film has been reviewed by Jarrod Baker. The DVD specifications and extras have been reviewed by Downunder.